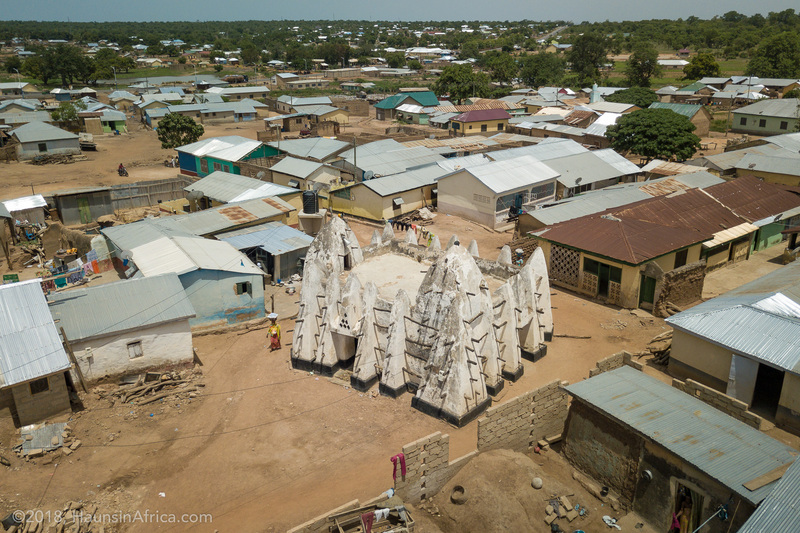 This is one of a series of posts about Ghana’s only six remaining historic mud mosques built in the Sudano-Sahelian architectural style. 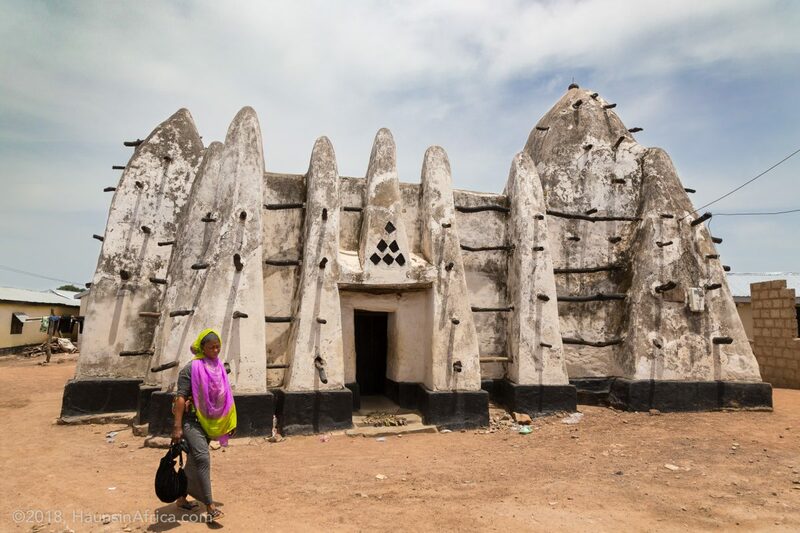 On my trip to see the ancient mosques in northern Ghana, I was disappointed to find two of the three mud mosques in the Upper West Region to be collapsed and abandoned. 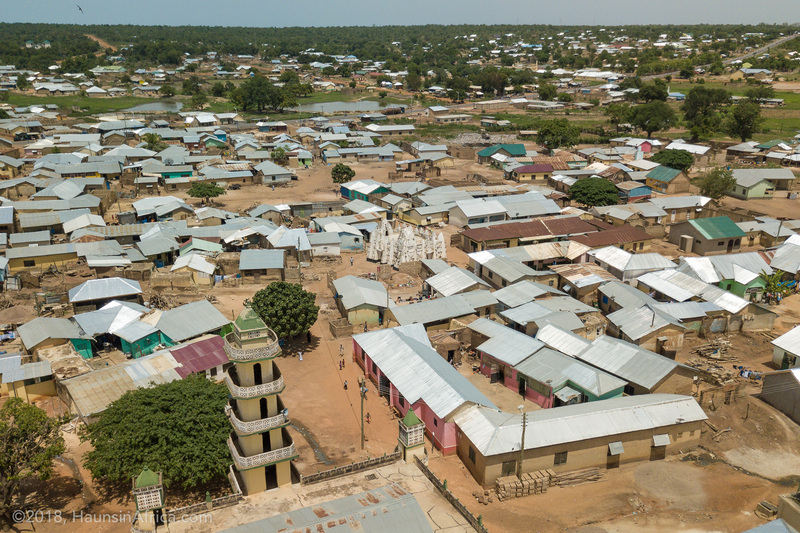 Entering the Northern Region, my first stop was in ex-president John Mahama’s hometown of Bole where another Sudano-Sahelian style mosque was reported to stand. I was pleased to find it not only standing but in great condition and still in use. I greeted the chief imam, signed the visitor register, paid my 10 cedis and was given a guide to take me in. 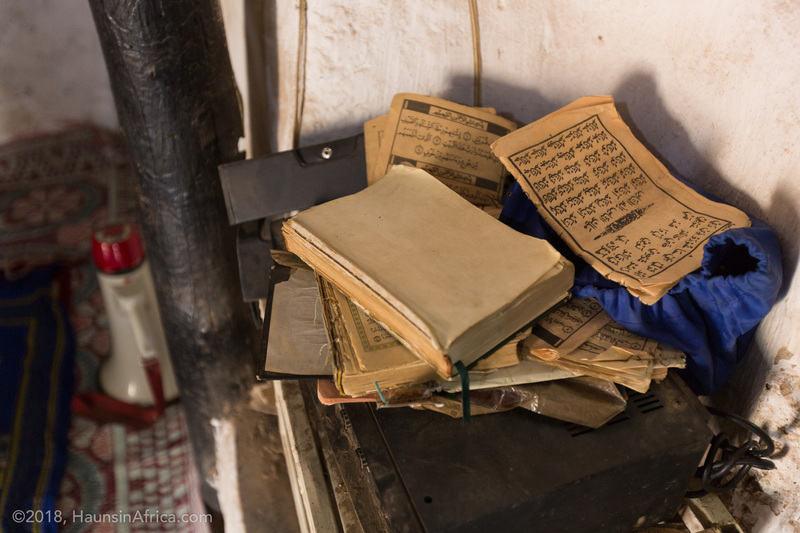 I arrived a bit after noon time and they were preparing for midday prayers so my tour was a bit rushed. 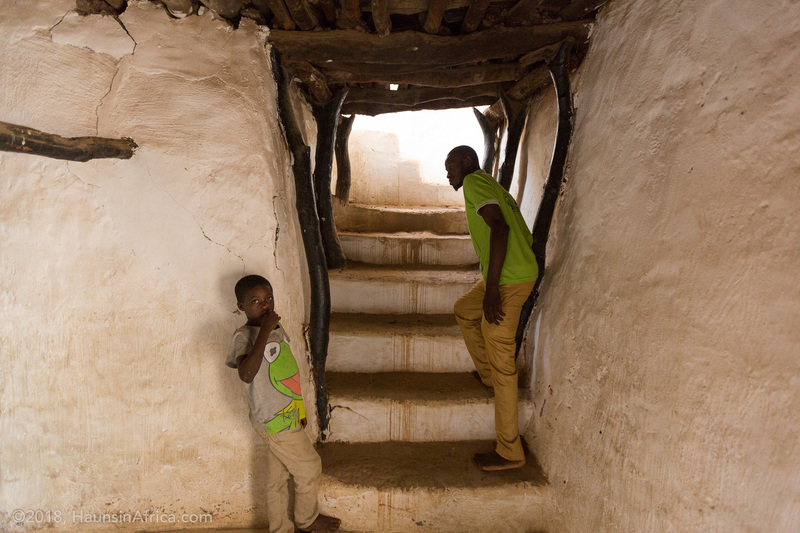 As with Nakore mosque, the guide had very little knowledge of the history and construction of the old mosque. 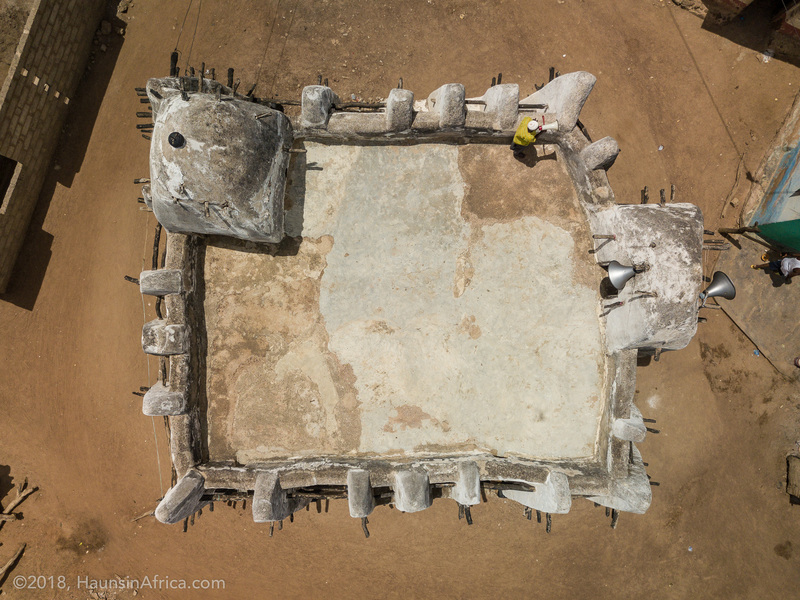 However, Denis Genequand and his team of archaeologists sponsored by the Swiss-Liechtenstein Foundation for Archaeological Research Abroad (SLSA) did a thorough survey of the Bole Mosque in 2015. 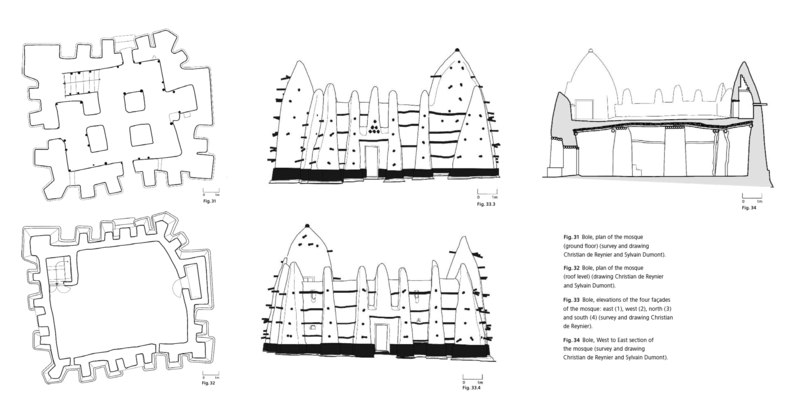 They published their study of the mud mosque in the SLSA 2015 Annual report (p.53-65) and it includes the history of the mosque, a detailed architectural survey and results of radiocarbon dating on pieces of wood and charcoal from the mosque. 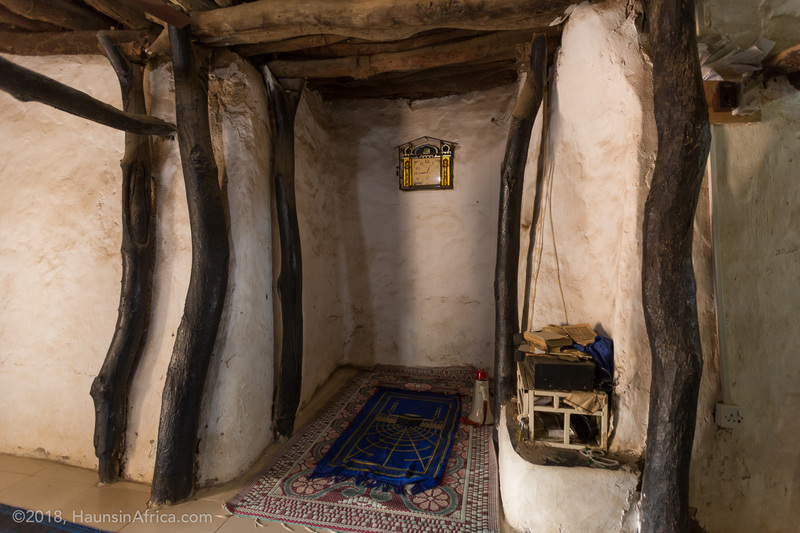 The oral traditions surrounding the ancient mosque’s history are inconsistent and confused at best. Genequand’s research casts serious doubt on claims of the mosque being 200-300 years old. 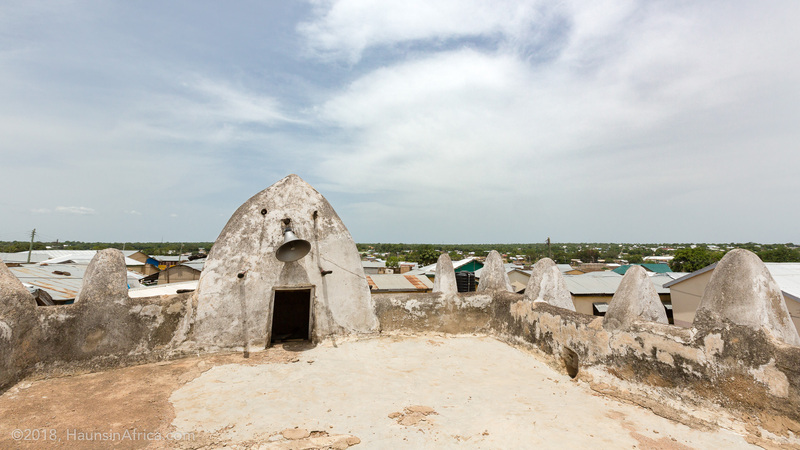 His Bole mosque radiocarbon results suggest otherwise and combined with the historical razing of Bole by Samori Touré in 1896  they place its construction in the early 20th century. 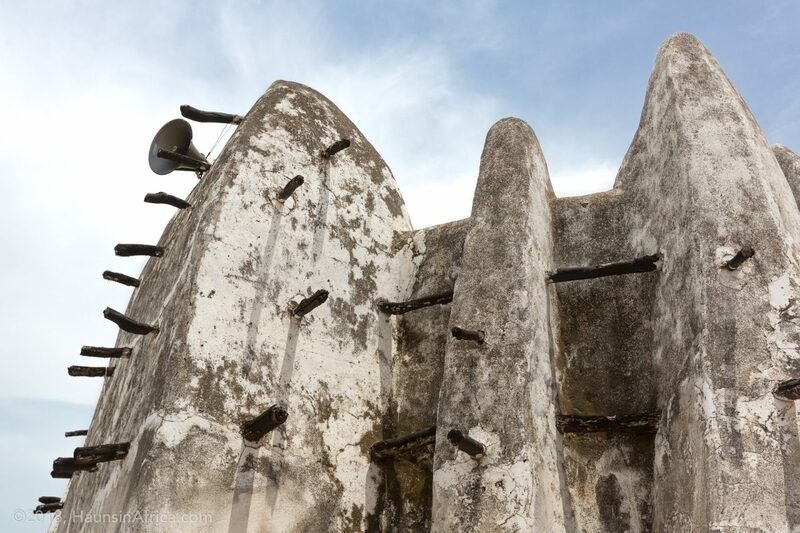 One interesting feature of the “ancient” Bole mud mosque is that the wooden poles that are found in and between the buttresses do not function as any sort of structural support to the building. 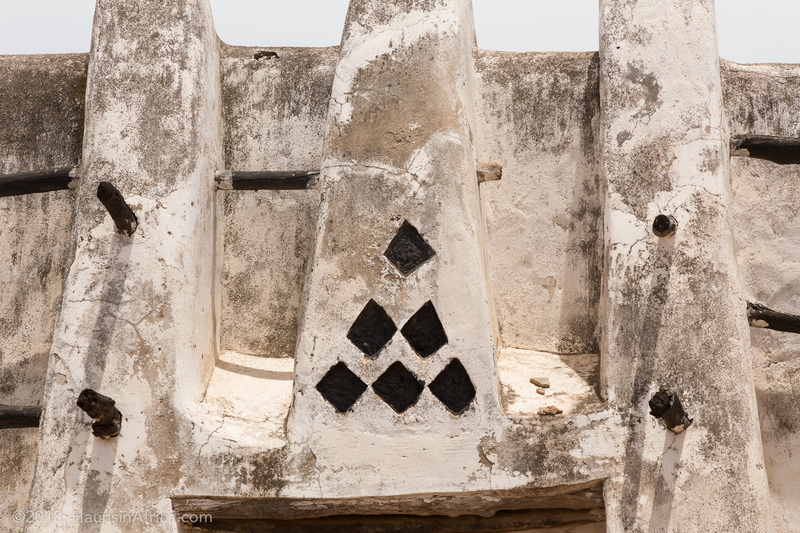 They are used as scaffolding for times of maintaining the plaster and painting. 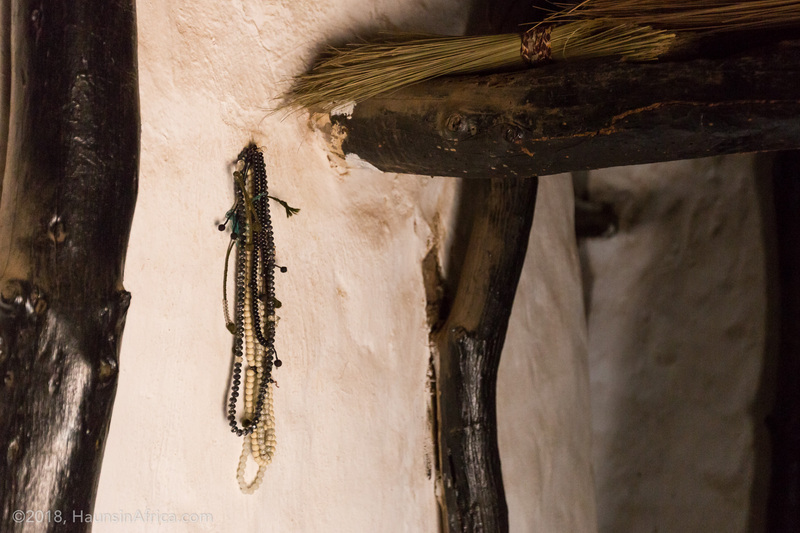 However, they are mainly decorative features meant to maintain the West Sudanese aesthetic. 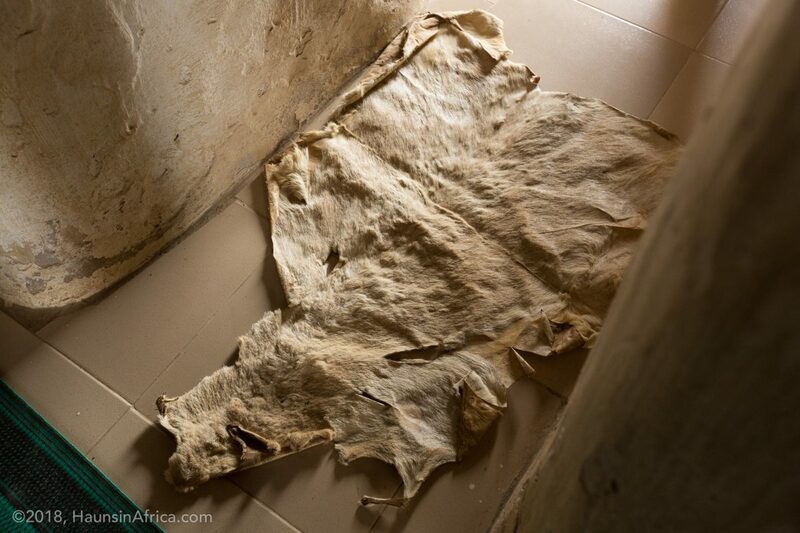 I wonder if this applies to some of Ghana’s other remaining Sudano-Sahelian mosques. It may explain why their towers are prone to collapse and reinforce the idea that most of them are only around a hundred years old. 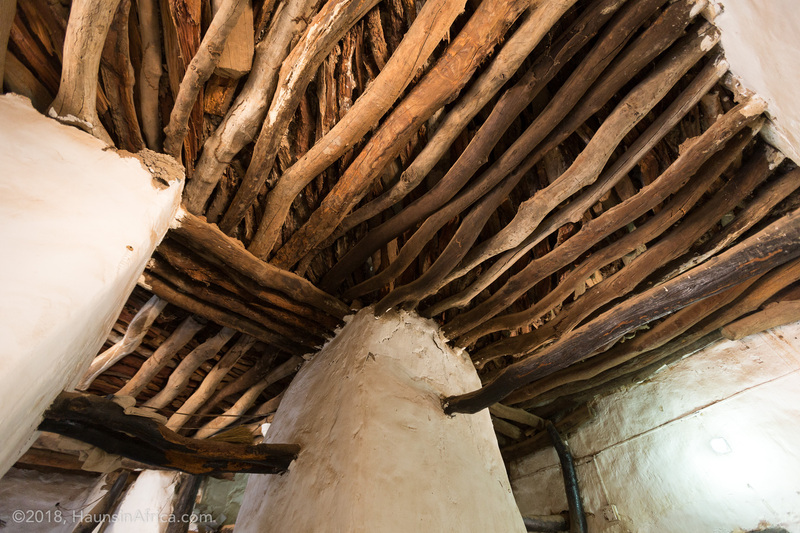 At that point, those with a true mastery of Sudanic mud architecture had passed on. 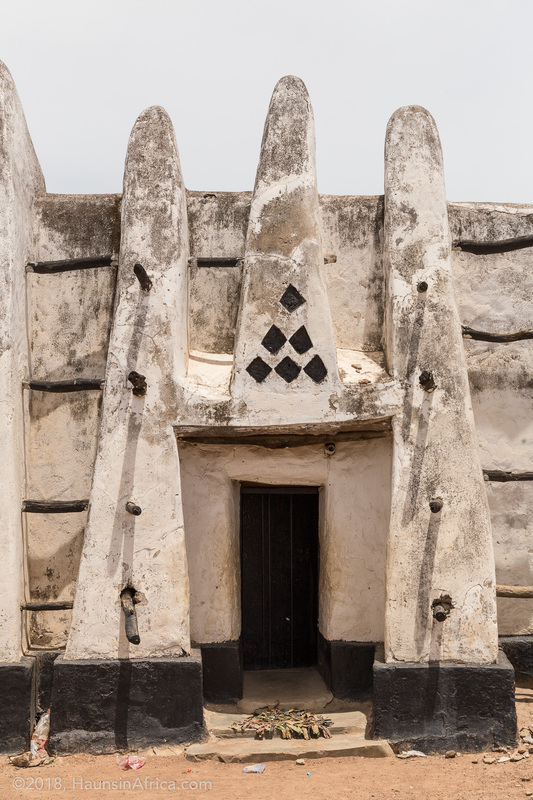 Along those same lines, the Bole mosque has the shortest towers of all the mud mosques of Ghana. One could describe Bole’s less as towers and more like pyramidal domes. Perhaps also related to the lack of structural support from the bush poles? 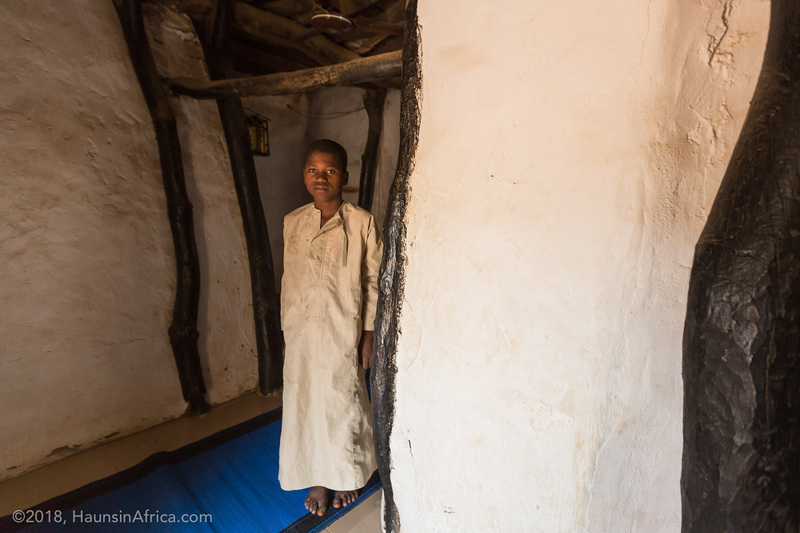 Like the Nakore historic mosque, a few modern improvements have been made to this building. The most egregious (in my opinion) is that in the last year or so they tiled the floor. In Genequand’s 2015 images, the floor is of traditional plaster but that is now covered by mass-produced, ceramic, square tiles. I was disappointed to see that the local community has put their energy and finances into modern tiles but left other parts of the mosque in disrepair. 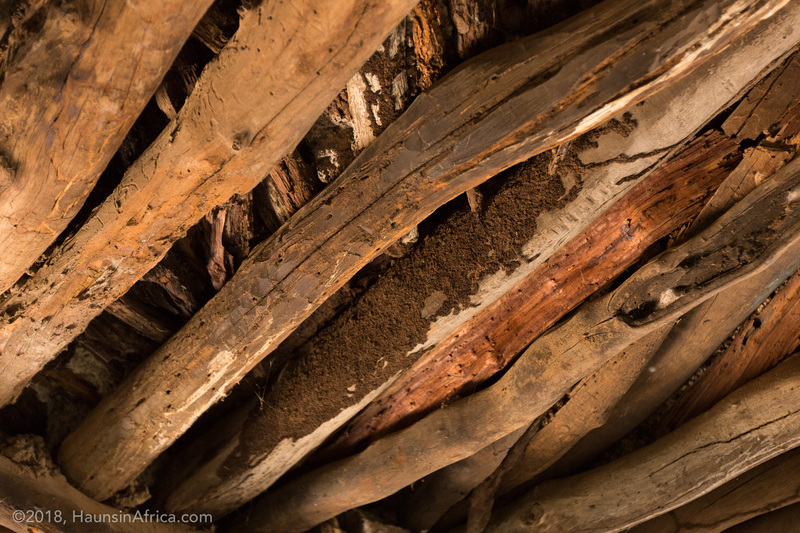 The building could use a new whitewashing and the support beams in the ceiling were visibly infested with termites. Unless something is done to control the termites, I wouldn’t be surprised if the roof collapses in a year or two. 1 Levtzion, N., 1968: Muslims and Chiefs in West Africa. A Study of Islam in the Middle Volta Basin in the Pre-Colonial Period. Oxford.